Artificial grass can be used in a variety of ways to enhance your overall pool experience. 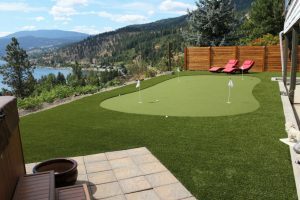 Our Synthetic Turf Canada team can custom design the pool area you’ve always envisioned with top of the line products. Still need some convincing? We’ve outlined the top 5 ways Synthetic Turf will improve your outdoor pool area. 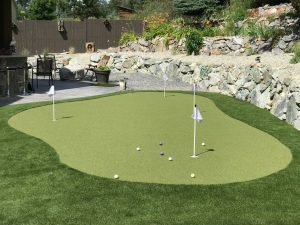 Synthetic Turf provides pool and homeowners with a softer and safer alternative to concrete, bricks and other materials commonly used around pools. 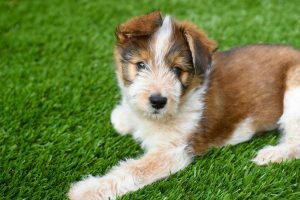 Since Synthetic Turf doesn’t require harmful chemicals from pesticides or fertilizers, it provides a safer alternative for you, your family and pets to enjoy. 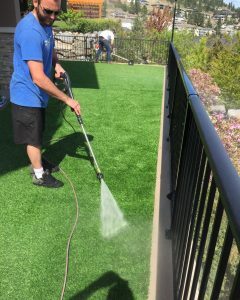 Also Synthetic Turf is not affected by the elements or excess water, so you never have to worry about a muddy poolside or injuries from hard and slippery surfaces. Plus, even on the hottest day, it won’t burn the soles of your feet! Spend more time lounging around your pool and enjoying the water, and spend less time on lawn maintenance without compromising the appearance of your pool area. While natural grass requires weekly mowing, trimming, and watering, Synthetic Turf’s products are virtually maintenance-free, require no water, chemical or fertilizers, contain recyclable components and reduce wear and tear from weather conditions. Enjoy the smooth and natural-looking grass, while optimizing your pool time! 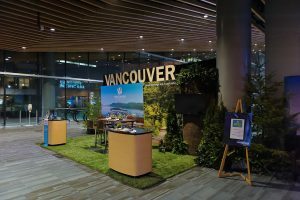 Lush and lifelike, our artificial grass products provide a realistic “fresh cut” appearance. Synthetic Turf offers a wide selection of high quality lawn and landscaping solutions including SoftLawn®. 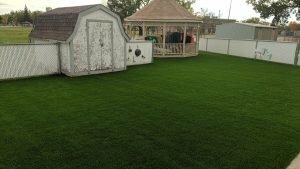 SoftLawn® utilizes a soft polyethylene UV protected synthetic fiber and provides homeowners with an authentic green grass look. Synthetic Turf offers a variety of gorgeous lawn and landscaping options to ensure that your poolside is pristine! For an added touch, we offer a number of landscaping products for gorgeous walkways, stepping stones, flower beds and other decorative additions. The are infinite ways that Synthetic Turf can beautify your poolside! The benefits of artificial turf outweigh those of natural grass for a number of reasons. One of the biggest benefits, especially for Synthetic Turf around pools, is its ability to drain excess water. Many materials, including natural grass, will have problems draining water that is bound to happen with all the cannon bombs, dives, belly flops and splashing. With Synthetic Turf, you never have to worry about draining water away from your pool! Save time, energy and money when you install a Synthetic Turf while simultaneously increasing the value of your property. 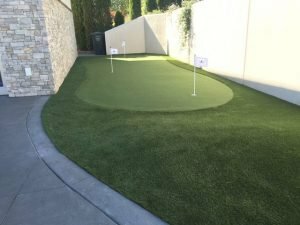 Although the initial installation price of Synthetic Turf can be expensive, you will save in the long-run. The long-term benefits include saving on gas, oil, water and general upkeep of lawn mowers and trimmers. Furthermore, artificial grass has come along way since it was first invented and used in 1966. It’s durable, can withstand harsh weather conditions and comes with a lengthy warranty to ensure Synthetic Turf is a savvy investment. 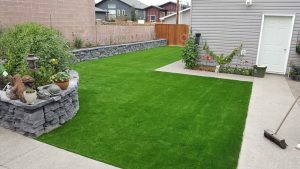 It’s not a surprise that more and more homeowners are replacing their natural lawns with artificial grass in order to increase the resale value of their homes! Contact Synthetic Turf and experience a greener world today!